“The Hidden Gem” is all about my personal favorite films. And while some of the films I discuss may not be hidden to most movie fans, they are hidden to a majority of my friends and people that I have talked to. So I want to discuss them for three reasons: 1. Tell you why they are great. 2. Get more people to see the particular film. 3. See how many of you readers have seen this film and also love it. When I was growing up my mom worked a lot of weekends. My sister was away at college, and my brother was in high school so he was always out with friends. As a result, my dad and I were together a lot, our most common activity was going to see movies. Now most of these movies I had never even heard of. My dad read about them online and wanted to see it so I got to go with him. The year was 1999, and I was 12. My mind had recently been blown away by The Matrix, and while The 13th Warrior wasn’t exactly earth shattering, it was still pretty memorable for me. In AD 922, an important emissary, Ibn (Antonio Banderas) is banished from his homeland. The nomadic outcast comes across a band of Norse warriors who coerce him into joining them when they are summoned to fight mysterious creatures legendary for consuming every living thing in their path. Eventually surrounded by the frightening and ferocious foe, Ibn must conquer his personal fears and help battle the illusive invaders–who emerge out of the shroud of fog in the black of the night. 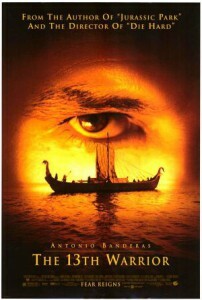 The 13th Warrior is Michael Crichton’s retelling of the classic Beowulf. At the time, I did not know this, but then in high school I read Beowulf in English class (okay I didn’t read it. That was the time I discovered SparkNotes.) I quickly realized that they are essentially the same story. The things I love about this film are the relationships between Ibn and the Norse Vikings. Ibn learning about the culture of the Vikings and the Vikings learning to respect the intelligence of Ibn was something that I always found very fascinating, even to this day. The action in the movie is great with large set pieces that give plenty of blood and brutality. The 13th Warrior is not a perfect film. It struggled to even get made, and then fought with the studio with re-shoots done by Crichton himself. There were plenty of critics at the time that bashed it. But for me, this is a movie I would suggest to any action/adventure enthusiast. It will hold your interest for the full length, and while it might not be the best thing you have seen, it is hard to say it was bad. Have you seen The 13th Warrior? What did you think of it? Do you have any suggestions on a future “Hidden Gem” article? Let us know in the comments below.